Having parked—and relished in the fact that you get to avoid paying the park entrance fee—you now have a choice: begin heading up the Dickey Ridge Trail on the right-hand side of Skyline Drive (marked with a cement post) or cross the road and backtrack 2/10 mile through the woods to the proper start at Mile 0.0. If you are obsessive like me, you’ll opt for the latter—determined to complete the hike in full. And so it goes, on to Mile 0.0. 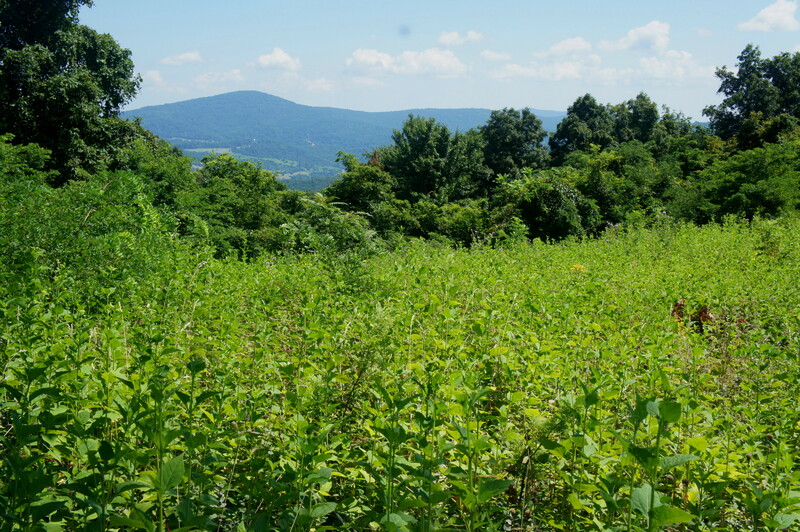 Despite being the northernmost trail in Shenandoah, Dickey Ridge Trail begins with little fanfare. 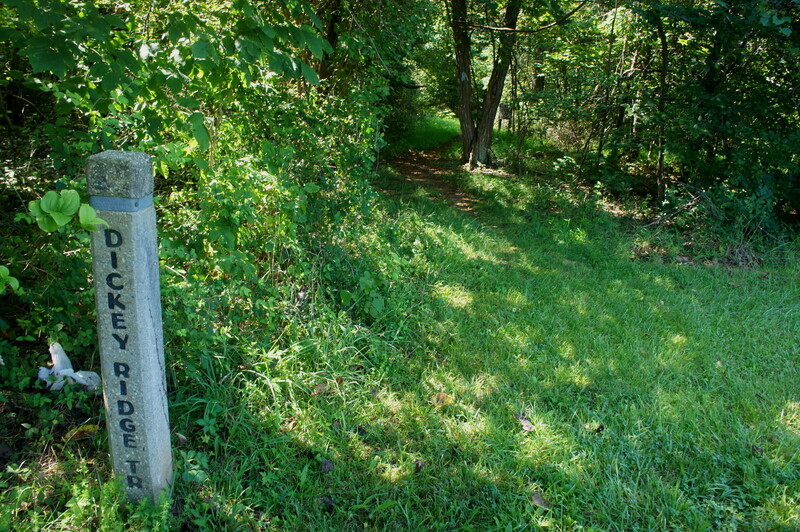 Overshadowed by the exultant 7-Eleven across the street, the trailhead at US 340 involves only a small clearing and one of Shenandoah’s ubiquitous cement trail markers, carrying trail distance information so maddeningly small that it takes some desperate squinting to read. 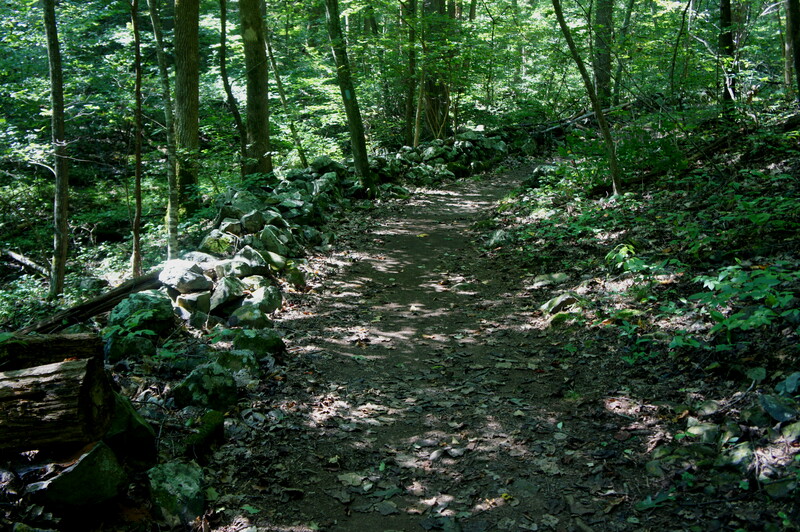 Leaving the traffic of US 340 behind, the trail immediately enters dense woods in an area that was once a broad pasture. The new growth forest recedes briefly at 1/10 mile, where a sunny patch wrestles with waist-high grasses and thorns. Having gained virtually no elevation so far, the trail emerges onto Skyline Drive at 0.2 mile, where more than likely your vehicle is still sitting, baking in the sun. Continuing across the street, the flat and wide trail begins to climb ever-so-gently as it follows a dry streambed on the right. 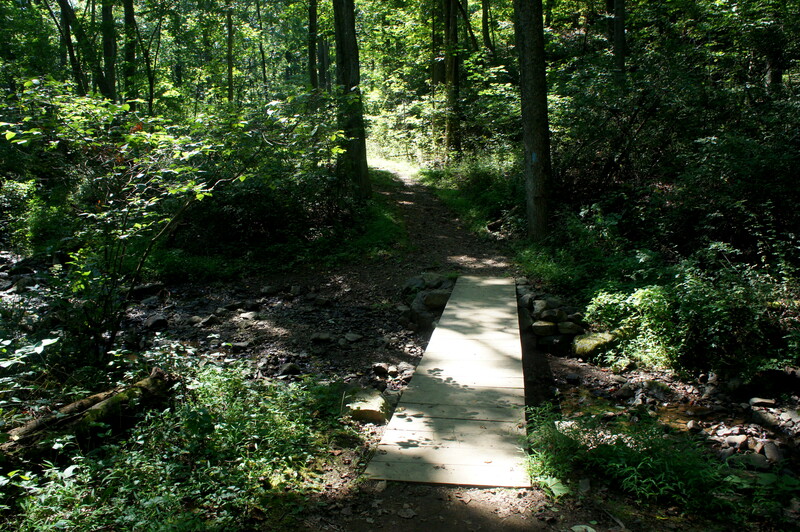 By ½ mile, the creek is most likely bearing water, and after more gradual ascent, the narrowing footpath crosses a simple wooden bridge at 2/3 mile. The sound of Skyline Drive never quite goes away as the trail follows the left-hand bank of the creekbed. The scenery around is enough to distract, however: a peaceful ravine filled with a diversity of deciduous trees that are surely marvelous in the fall. At 1.4 miles, the trail is bounded on the left side by a short but apparent rock wall, a timeworn testament to the residents who once called this area home, before the creation of the park in 1935 pushed them off their land. 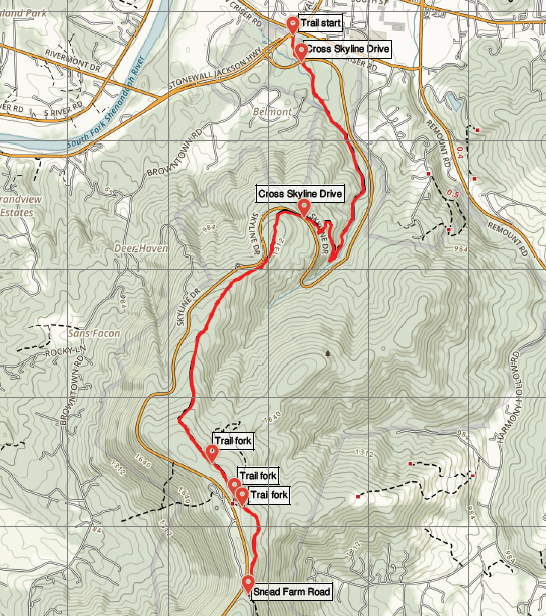 At 1.45 miles, while the rock wall continues straight, the Dickey Ridge Trail takes an abrupt right, bearing north as the gradient increases. This switchback too is reinforced with greenstone (perhaps this time the handiwork of the Civilian Conservation Corps?). At around 1.7 miles, the path rounds a steep, left-hand bend, followed by a sharp, right-hand bend a minute later. More stony rubble is visible on the left as the trail climbs to meet Skyline Drive again at 1.9 miles. Be careful crossing the street: the trail resumes about 30 yards up the road, requiring hikers to remain alert as they briefly work their way up the shoulder. Beyond the crossing at around 2 miles, look for the stony remains of what was potentially an old house on the left. By now, the trail is downright steep, climbing at a steady incline for around ¼ mile. There is a brief respite at 2.2 miles as the path levels out during a lengthy straightaway. At 2.35 miles, Skyline Drive appears again on the right, though the trail does not approach it. At 2.4 miles, the trail climbs again, beginning to resemble a stair-step routine that defines the next mile. At 2.8 miles, the footpath cuts through an old stone wall and continues to climb. Around 3.5 miles from the start, the trail finally settles on a gradient close to level, an incline that will mostly hold for the rest of the hike. Amid a forest of tall tulip trees and ubiquitous spicebush, the Dickey Ridge Trail meets the first of three junctions with the Fox Hollow Trail at 3.75 miles. Stay right and follow the well-trodden path (at this point sharing a track with the Fox Hollow Trail) to a second fork at around mile 4. Here hikers will encounter a sudden and jarring sight: an open meadow, free of trees, a rare occurrence in a park that is 95% forested. At the fork, take a right to reach the Dickey Ridge Visitor Center, situated about 500 feet to the southwest, across Skyline Drive. 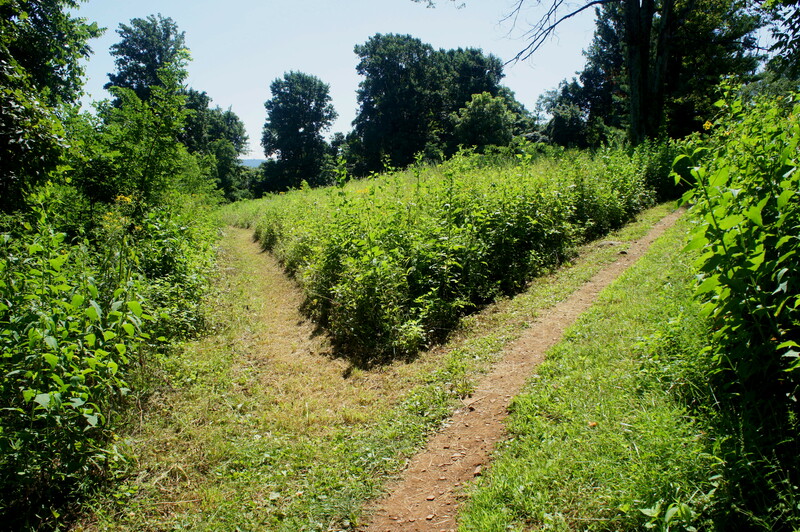 Stay left to complete the walk on the Dickey Ridge Trail, skirting the east flank of the meadow. Visible across the valley in the distance, High Knob (2,388’) lies outside the park but remains part of the Blue Ridge Mountains, which form the backbone of Shenandoah. Within 150 yards, the path meets a four-way junction as the Fox Hollow Trail intersects with the Dickey Ridge Trail a third time. Stay straight. Of course, those with the luxury of a shuttle pick-up can continue on the Dickey Ridge Trail to its end at Compton Gap (Skyline Drive Mile 10.4). Others are best-suited splitting the trail in two, completing this slightly shorter but harder section first while leaving the second half for another day. Allot around 4-6 hours for this out-and-back hike, which takes far longer coming up than heading back down. 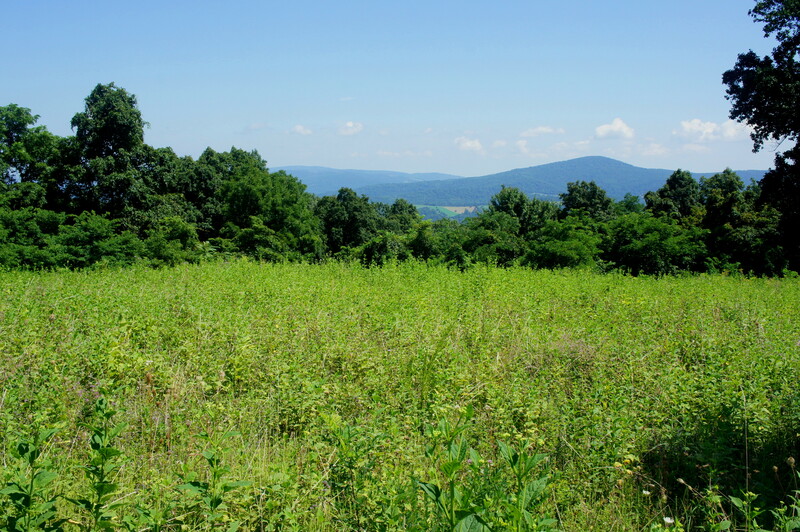 This entry was posted in Shenandoah National Park, Strenuous Hikes, Virginia and tagged Dickey Ridge, Dickey Ridge Trail, Fox Hollow, meadow, Shenandoah, Snead Farm Road, Virginia, Visitor Center. Bookmark the permalink.